First-ever Wrigley Ocean Marathon featured more than 100 competitors. Only one finished. CATALINA ISLAND — Long distance swimming might not be the most efficient mode of transportation across the Catalina Island. Competitive long distance swimming, however, was both a means to draw attention to the island and part of a larger craze during the height of William Wrigley’s foray into Southern California. The chewing gum magnate sponsored Wrigley Ocean Marathon in 1927, a few months after New Yorker Gertrude Ederle became the first woman to cross the English Channel. Of course crossing the Catalina Channel would be a slightly longer course – 22 miles from the Isthmus/Two Harbors to Palos Verdes Peninsula, compared to the 21-mile trek across the English Channel. 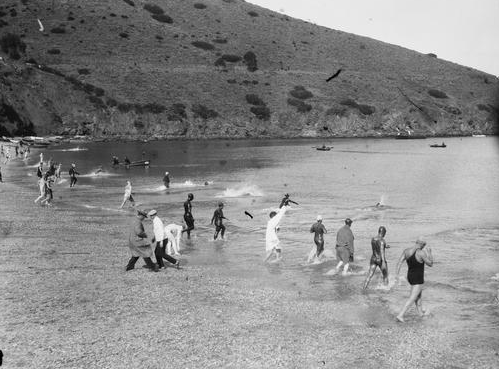 The media coverage of Ederle’s trans-channel swim in the summer of 1926, according to the official Catalina Island tourism page, had motivated Wrigley to host a long-distance swimming event of his own. Hosting such an event out of Catalina Island could help bring added publicity to island, Wrigley hoped. More than 100 men and women would ultimately sign up and compete in Wrigley’s event, which started at the Isthmus and featured swimmers navigating across the channel to Point Vicente 22 miles away. The ocean marathon began Jan. 15, 1927. Only one person would finish – 17-year-old Canadian George Young. The Toronto native completed the swim in 15 hours and 44 minutes, earning him the winner-take-all cash prize of $25,000. Swimmers were apparently required to follow several safety protocols in order to compete, such as being accompanied by a boat with a sanctioned official aboard. Each swimmer also had to provide certification from a doctor stating he or she was in good physical condition. Most of the swimmers gave up before nightfall. Only 12 swimmers were still competing after last light (though a full moon helped illuminate the channel, according to the Island Company’s blog post). A retrospective article about Wrigley Ocean Marathon in the June 26 issue of Sports Illustrated described Young’s finish. There were two female swimmers roughly one mile behind Young when he finished the race. Neither had finished, though Wrigley awarded each $2,500 for their efforts. Wrigley Ocean Marathon, for better or worse, would not return for a second time, as the chewing gum magnate decided against hosting the race again.